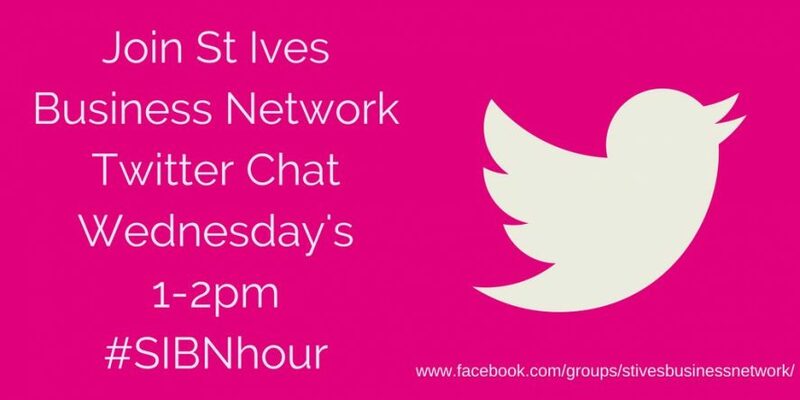 I have been getting involved with a Twitter hour known as #SIBNhour recently, it’s a fab twitter hour that meet (online) every Wednesday between 1pm and 2pm. It’s for anyone that works or networking in or around St Ives, Cambridgeshire (not the Cornwall one) and it’s been created by Emma Read, a virtual assistant. My favourite thing about this group is that, although it has been created by Emma, it is run by a different host each week. One week it could be an Independent Financial Advisor, the next week as Estate Agent and another week me – well that is certainly the case for 22nd February. That’s right; I am hosting the #SIBNhour on Wednesday 22nd February from 1pm-2pm. I will be encouraging people to get involved, ask questions and advice as well as introducing themselves and answering some of my own questions too. I have been involved in many Twitter hours over the years and have seen some great ways in which it can be done right and hopefully I have collected enough tips and advice to make sure I can make #SIBNhour a success too – but it will need interaction from fellow tweeters so please pop the date in the diary and get involved if you can. The #SIBNhour is a brilliant way to gain brand awareness for you and your business while getting to know other people in business which will help gain recommendations and sales. Also, if you are a one man band, it can be quite a nice social break from whatever you are up to and you’ll speak to people you may never have come across before so it could be well worth while for you and your business. So pop the date in your diary now, then on 22nd Feb grab some biscuits and a cuppa and follow #SIBNhour to get involved in some great online networking for your business.